Allison Lee and Daniel Tamburro are hoping to be Canada’s next rising stars. 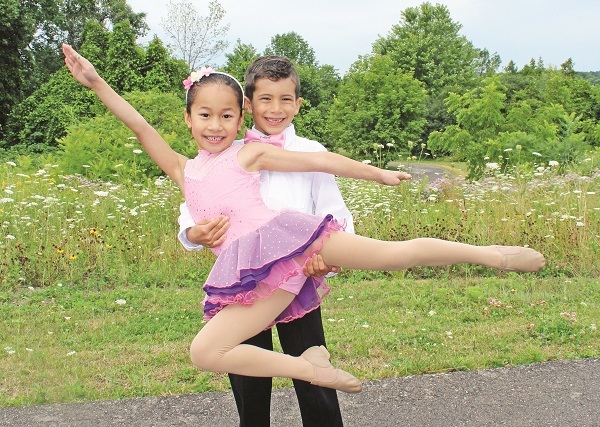 The seven-year-old dancing duo is set to compete in the junior division of the Canadian National Exhibition’s (CNE) Rising Star Talent Competition in Toronto on August 21. Allison, of Aurora, and Daniel, of Maple, are students at Evolution Dance Studio in Maple. Inspired by their older sisters, Daniel and Allison started taking dance lessons at age three. “I started because I saw my sister doing it and I wanted to do it too,” said Allison. “I watch a lot of dance shows and videos,” added Daniel. They were chosen to partner by the teachers at Evolution six months ago and have been working on the duet ever since, dancing to the song Dance With Me Tonight. After a lot of practice and preparation, they brought the routine to a variety of competitions including the Bedazzled Dance Champions, a national competition held in Blue Mountain over the Canada Day weekend where they won second overall in the “Mini solos and duet/trios” category. They were encouraged to enter the routine into the Rising Star Competition by their teachers Natalie and Nicole Cultraro. Now they are poised to compete on the international stage at the CNE. The routine, called an open duet, combines two styles of dance – acro and jazz. It also features flips, lifts, ballroom dancing and moves like the worm and the helicopter. The studio has a good track record at the competition. Last year, student Alexandra Gorya won the title of Junior Rising Star Grand Champion 2014. Daniel’s sister Sabrina also participated in last year’s competition. Allison and Daniel put a lot of time and commitment into dance and the studio is like their second home. They are both in the competitive dance program and aside from the duet, they also take tap, jazz, acro, hip hop and ballet classes. They are in the studio three to four days a week for two to three hours each day. The duet alone took 10 extra hours of practice on top of their regular studio time. Dance also teaches them other skills such as team work, time management and discipline. Daniel is so passionate about dancing, he is planning to pursue it in the future. Allison is not sure where dance will take her, but one thing is for sure: “I love to dance,” she said. This year marks the 29th annual Rising Star Talent Competition, one of the longest standing competitions to promote undiscovered talent before the popularity of talent TV shows and has discovered the likes of crooner Matt Dusk, famed choreographer and dancer Blake McGrath and many more. The talent competition is open to dancers, singers, actors and musicians ages six to 25. The Rising Star Talent Competition will take place at the CNE August 21 – September 6 on the International Stage in the Enercare Centre. The junior preliminaries, the category Allison and Daniel will be participating in, will run from August 21 – 24.